because today is local elections day. calls a general election next month or next year. used as a polling station. So I had another day to recover. Don’t worry, I shut up about my ears within the next few days. I think I got tired with being so angry at having to write about how they were no better. Plus there were other obsessions to cultivate instead, like the general election – something that I knew even then to be not the sort of thing likely to win friends at school, and therefore something about which I ought to remain very tight-lipped. You wouldn’t have local elections and a general election held on different dates nowadays. It would be considered “too much” – as if there’s such a thing as “too much” democracy. Give me the child until he is seven (and 44 months) and I will show you the man. Back then I remember this sort of activity as being explained away as “showing an interest”. Would it now be classed as some kind of behavioural disorder? Because, seriously, what sort of person would choose to spend their free time WRITING OUT 650 ELECTION RESULTS BY CHOICE? And then plotting EACH AND EVERY ONE ON A MAP? I am now in the 4th year juniors and I have one primary school year left. This diary covers that year. then we wrote an autobiography on ourselves. My disinclination towards cheese pie, recorded so pointedly above, would only have been compounded when I found myself staring at a plate of the stuff an hour or so later. Euucchh. 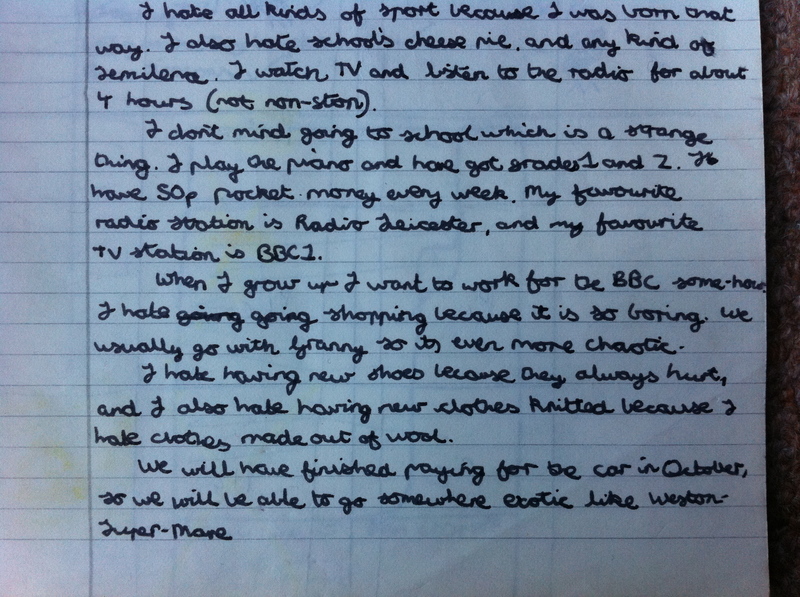 Perhaps I should make clear that the 10-year-old me did not solely wear clothes entirely made of wool. This was a reference to the numerous jumpers, hats, scarves and gloves knitted for me chiefly by my gran, who loved nothing more than to busy herself with one of those pull-out knitting patterns that came free with Woman’s Weekly. I’m quite surprised actually by how many things I claim to “hate”, from new shoes to shopping to semolina. Oh dear: so full of hatred at such a young age. Clearly this is where it all began to go wrong. But as for what I want to be when I grow up… nothing’s changed. Stop that giggling at the back. …More BBC stuff this morning. On Thursday I’d got a catalogue of BBC clothes, pens, badges etc. of which I’ve ordered things. Today I got a catalogue of wallcharts and a timetable. This afternoon we went to Birmingham Airport to look round. Of the BBC-branded merchandise that I ordered and ultimately received, the only ones I can remember (and this is embarrassment enough) are car window stickers displaying the logos of the Six and the Nine O’clock News. I stuck them – proudly – on the car window by which I always sat. And they stayed there for months. Dear God, what had I become?